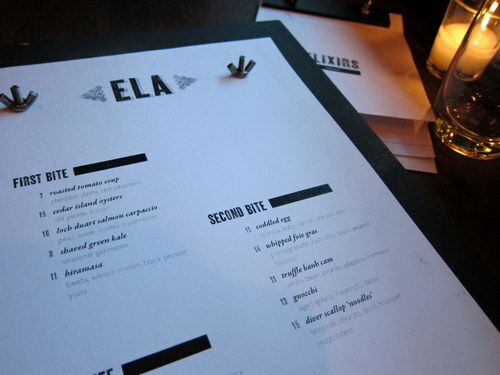 For another round of Sunday dining in Philadelphia, E and I visitied Ela in Queen Village. That corner has been transformed into a beautiful space. The placer is warm and woodsy, but quite sophisticated. And we felt like young whippersnappers dining there, and we are not young! There seems to be a more mature clientele there. Bread! Nothing special here, but it’s perfectly fine bread. 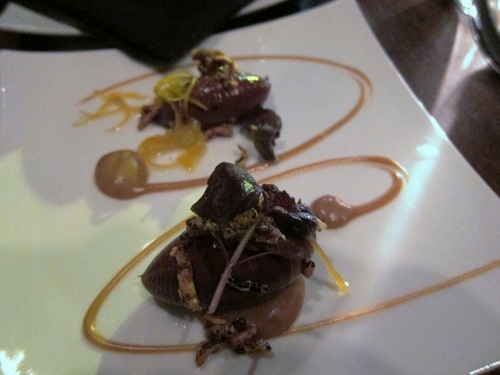 The hiramasa with beets, winter melon, black pepper, and yuzu. This was quite delicious, especially with the beets. You know we love anything with beets! 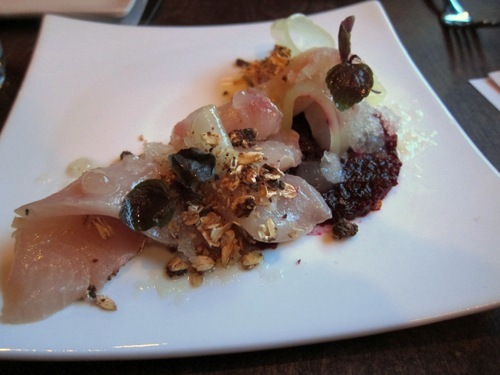 The fish was the freshest of the fresh and the oats were an interesting touch! Everyone has been raving about these scallop noodles. Holy seafood, they’re amazing! 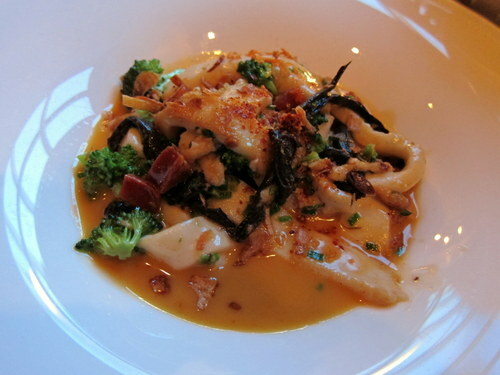 Theses “noodles” are made from diver scallops and are served with broccolini, chorizo, and trumpet mushrooms. How do they make scallops into noodles? I don’t know and I don’t care, I just want to eat them! 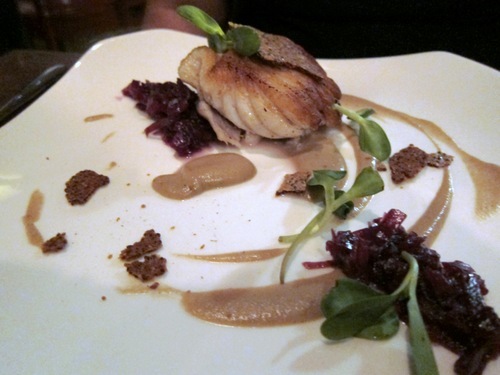 E got the skate with braised cabbage, sunchoke puree, and whole grain mustard. Here we are with the skate again! I don’t even like duck normally, but I was somehow drawn to order this dish. 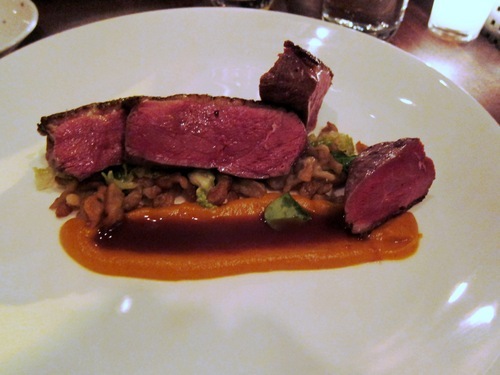 This duck breast is served with pretzel spaetzel and a smoked butternut squash puree. I liked duck! For dessert, E went the safe route and got the manjari chocolate. It’s a chocolate custard type thing with meyer lemon and peanut butterscotch. I took the riskier route and got the deconstructed dessert… a liquid cookie dough poured over semi-freddo, banana, and chocolate chip. I’m not sure that I would call this good, but it certain wasn’t bad. It was just mostly bizarre. The liquid tasted like dough, and I’m not sure that a sauce should taste like cookie dough. 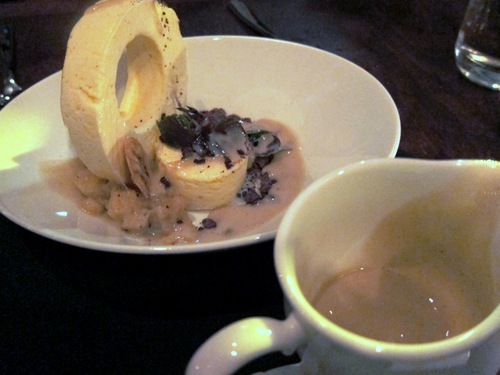 Aside from the strange dessert, we both really enjoyed the meal here. 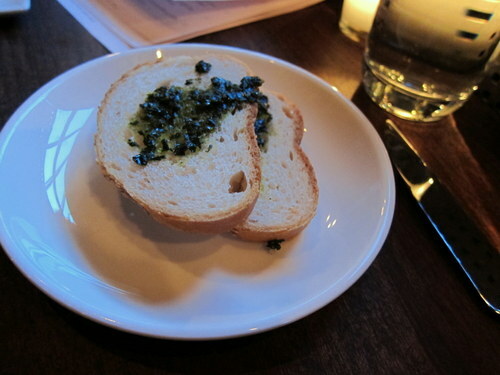 It was tasty yet quite interesting food, and the service was great. The scallop noodles were an absolute standout! I’m a little late to this post, but I just visited Ela myself for the first time and I had the exact same impression– while I am most definitely in my 30’s, I felt like a bit of a youngster there! I had the fried sweet potato balls (they certainly were given a more elegant name than that, I just can’t remember it…) and they were delicious. We sat at the bar and the bartender was so gracious and attentive. Plus she mixed up some mean cocktails. I really enjoyed the place!